Map It! 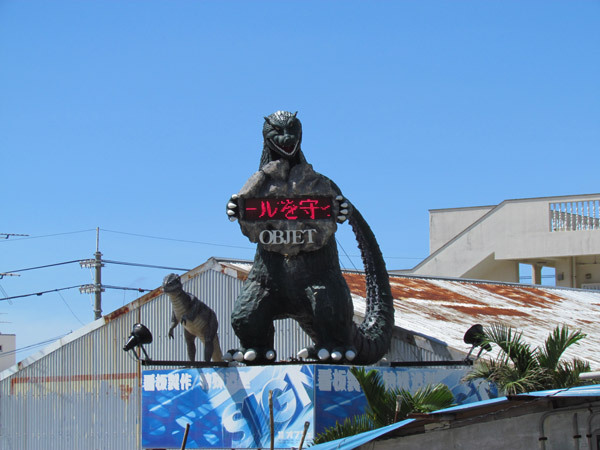 Okinawa: "Godzilla in Okinawa?" Well...sort of. This is not an attraction, but I did want to write about it for two reasons: 1) I am sure many of you, as you are driving south on Highway 329, are curious to know what this building is and what they do and 2) if you are thinking of running a business here on island or know someone that wants to then it is a good place to know just in case. Now, for those of you who have kids, I am sure you've heard them say (out loud), "Hey! There's the Godzilla!". Perhaps, many times. Or maybe you, yourself, told them a few times, "Hey Look!" There's the Godzilla. We're almost home". This is a sign shop called 'Objet'. They make specialized iconic statues and figures for clients (often stores). They even do personalized house placards for the home. Click on the picture album above. You will see some other figures they were working on or have worked on. 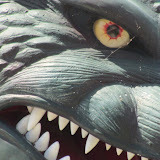 They did some of the animal statues at the Sunabe park and at the Koza Zoo. Again, this is not an attraction, but something to fill the void of curiosity about this wonderful island. Note: No one speaks English. I had to get help from a friend. I would only go in there if you have serious intentions of getting something done by them. They are pretty busy. But... if you do want something done, you will need someone who speaks fluent Japanese to accompany you. Location. Right off Highway 329, just south of the Comprehensive Park Main Entrance. The Godzilla is on your left if you are going south. You can't miss it! 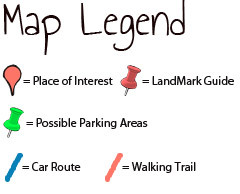 See some of the landmarks on the map to help navigate your way there. General location would be between Awase and Kitanakagusuku. Parking. I wouldn't park off Highway 329. It's best to find some parking spots behind the Godzilla building itself or around it. What to bring. Definitely a camera.